Improves ground clearance on the rocks. Prevents hang-ups on the rear axle. Plastic lockouts are made of strong composite material, and is very cost effective. 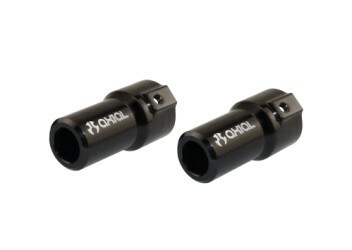 Aluminum lockouts are made of strong lightweight 6061 aluminum, anodized black with a laser etched logo. They also currently offer class leading ground clearance over any existing product on the market for the AX10.